I get anxious a lot. Whether it is related to travelling, or something completely different, I experience that feeling of my stomach clenching, an overwhelming feeling of nausea and constantly being on edge a lot. If you suffer with any kind of anxiety, you'll understand, that sometimes you feel like this for no reason at all. That's what anxiety is. A lot of people often say, what's the difference between being nervous and experiencing anxiety? It's quite simple, one is rational, and one is completely irrational. This means that typically, you can exactly justify why you are feeling nervous. You may have a test coming up, or you may have to speak in front of a large crowd. That's being nervous. What can make that anxiety is if you over think it so much you end up creating impossible scenarios in your head. Anxiety is irrational. Anxiety is the feeling you get and you can't think of a reason why. You just feel anxious. Worried. Scared. You may be out there living your best life and all of a sudden it hits you. That feeling of dread, that feeling of panic. You can almost feel it sweep you from beneath your feet. Like an unwelcome gail, knocking you several steps backwards, or in my case, forwards. When I feel anxious, I feel like I have to move very fast. The panic sets me in what I call "go go go" mode. Everything is happening so fast and if I don't live up to that I will fall behind. It drives me insane. The constant stream of irrational consciousness circles around in my head and I feel as if I can't break out of the everlasting feeling that is anxiety. I really wanted to do a video on the topic of travel anxiety but I feel as if I will articulate myself better in a blog post, so here we are. 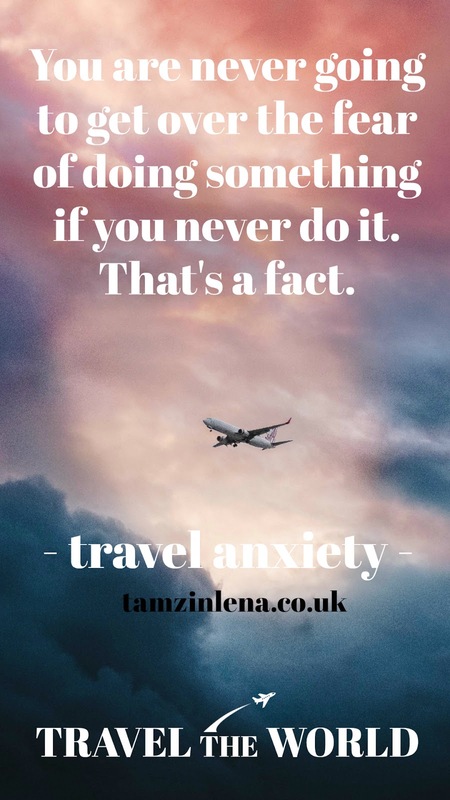 I want to talk openly and honestly about travel related anxiety, but not in a pushy or patronizing way. More often than not I will read a blog or instagram post about mental health that just doesn't resonate well with me. It's either because it feels too "perfect" if that makes any sense. They tend to offer this seemingly great advice, which never works. They tend to glamourise it slightly, and make it seem like it's such a good thing to have, and then eventually overcome. No. I'd rather not have it at all, thanks. I could go on and on about my general day to day anxiety. 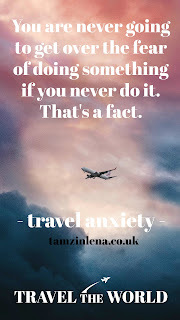 But in this post, as I have mentioned, I just want to focus on travel anxiety, because that is something I have really been trying to overcome these past few months. I have a constant wanderlust, I am always seeking out what I can do next and where I can go soon. Except one thing used to get in my way, this. This feeling. It still gets in my way, it's not something I have eradicated from my life completely. I don't think it's something I'll ever be able to shake, but it is something I am learning to manage. I am a BIG believer in "practice makes perfect" and that kind of mantra. People may say "You can't have travel anxiety, you go places all of the time!" that's because I refuse to let things stop me. It'd be far too easy to just give in, let it win, and not experience everything you want to. I'm not like that. One person I have to thank for that is my mum. Growing up, we went on holiday, I would say, either every year or every two years depending on the money situation. We would go somewhere different every time, and I have this to credit for my resilience when it comes to my travel anxiety. I think if I hadn't experienced this as a child/teen, I would have never had the nerve to step outside my comfort zone. If we had gone to the same place every holiday and gotten so familiar with the same airports, the same flight length, the same destination, the same people, the same culture, the same food, the same atmosphere, the same length of stay etc, I would have gotten so used to just that. Having the opportunities to go to new, fresh places was so so so valuable, I feel like it really made me a well rounded individual. I am not saying if you go to the same place often that you aren't a well rounded individual, but in my case with the issues I have, it was certainly so beneficial to me. Another thing that helped is that my mum rarely says no to me when it comes to going places on my own. That's my issue, travelling alone, and when I say alone, I mean literally on my own. If I throw an idea to go out somewhere on my own, like when I went to London, I don't even really have to ask her really, I have always just been encouraged to get out there. I think my mum does this because she knows how I struggle, but she shares my mantra of "practice makes perfect". She doesn't wrap me in a cotton wool, she likes to shove me into the real wool. Which in hindsight, I'm so thankful for. You are never going to get over the fear of doing something if you never do it. That's a fact. My first time ever going somewhere alone on a train (I've gotten a bus a million times on my own before, I'm talking long distance, new places etc) was when I went to Newcastle for a blogger's event. I was petrified. I documented my feelings on a vlog I did, you can check it out here. I've always been independent, my mum brought me up like that. I have always done everything for myself and that's another reason why I knew I was able to do things like this. In November, I went to London alone. I had only ever visited London once before, the year prior. the first time I went with my friend and her mum, and we did all the typically touristy things, because I was new to that. I didn't like it all that much to be fair. It was so busy. So claustrophobic and so chaotic that first time. 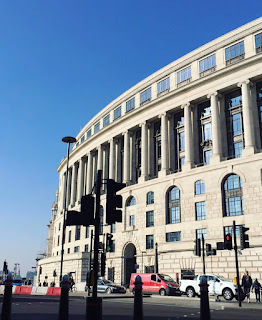 I wrote of London as a place I'd like to visit again. It just seemed like it wasn't for me. Then, my friend Andrea, who resides in Phoenix, Arizona, announced she was coming to the UK, London specifically for an event, and I just knew I had to snap up the opportunity to meet up with her. So I did. I booked the trains and the hotel by myself and when the day came, I headed out feeling the most apprehensive I have ever felt. And honestly, I had never felt so anxious than I did on that journey. I got on the bus to the train station, and that was fine. The turmoil started when I got off the bus and began the walk to the train station. This immense feeling of panic took over. I wasn't going to miss the train, I had plenty of time, yet I felt the need to sprint as fast as I could, through the bus station, across the road, through the train station and straight to my platform. On that walk, I was having to stop myself from throwing up. I was gagging (sorry for the TMI) and having a full on panic attack looking back. It was awful. When I got on the train, I felt so anxious I couldn’t do anything. I didn’t look or go on my phone or read my book or anything. I just sat there for 2 hours, trying to recover and get in the right frame of mind. When I got off the train, I was trying my hardest to not let that happen all over again. I had to get a tube to my hotel and that was an ordeal, but when I eventually made it to the station nearest to my hotel, I was so relived and so so so proud. I just stood and looked outside and around me (I was at Blackfriars station) and took this photograph, which means so much to me. 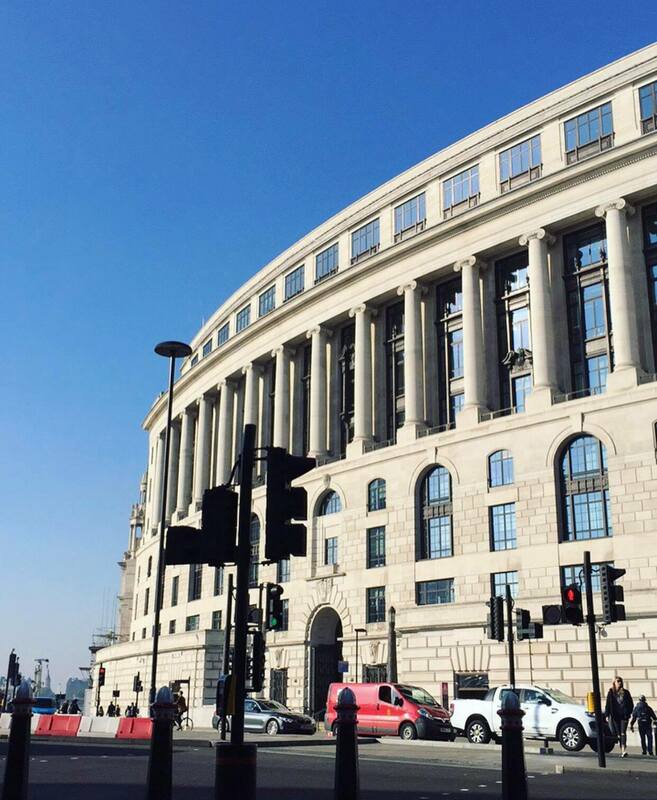 The sky was so blue and so clear and London was so quiet. I felt so calm after the most hectic morning. One thing I've never done alone (yet) is take a flight. I've taken flights without my parents, whether that be with family friends or school, but never actually alone. This year I want to, wait, scrap that, this year I am going to. I am going to fly alone. I am. I am a massive believer in if you say something will happen it will, mindfulness and positive thinking, and that makes me so excited. I am going to fly somewhere I really want to visit, long haul, and alone, no matter what might try to get in the way. I actually don't mind the actual flying - I love it. I love the fact you're up the sky, away from earth, I think it's really peaceful and relaxing. It's just the in-between bits I don't like, the airport, it's chaos, the never ending thoughts of "what about if I miss the flight?" even though I'll arrive to the gate two hours early. I hope you enjoyed this post. I hope it has come across as cohesive! I was unsure exactly what to say, so I thought I'd just literally share my thoughts and what was on my mind. I know I said I was planning on doing a video in relation to this, and I might still do. Maybe a Q & A all about travel anxiety and how I overcome it? I know I haven't spoken about what exactly I do in attempt to manage it, but I could speak about it more that video if you have some Q's. Leave them in the comments or tweet me, @tamzinlena and I'd be happy to answer them in a later Q and A.